Nuclear power is clean -- as long as you ignore "safety"! The author is a computer programmer and educational software developer. 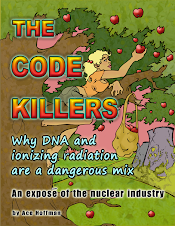 In 2008 he wrote The Code Killers, a pictorial expose of the nuclear industry. The Code Killers is available online at his web site: www.acehoffman.org . Earlier this evening I spoke to my city council about San Onofre Nuclear Generating Station's impact on a local fossil-fueled power plant which the owners wish to upgrade. San Onofre is about 15 miles north of here. I think most of my city's residents want the fossil-fueled power plant closed down entirely (and don't think much about San Onofre at all, since it's further away). But the budget crunch has demolished the "redevelopment agency" which, it had been expected, was going to stop the upgrade project. Suddenly the city itself has to take over trying to stop the project, and so Carlsbad is appealing to the California Energy Commission for regulatory authority to stop the project.